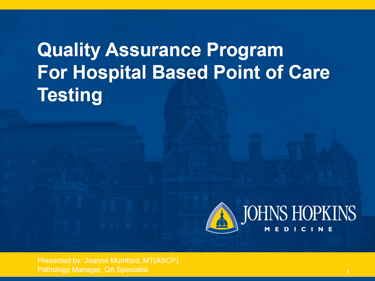 Jeanne Mumford is currently the Pathology Manager over Point of Care Testing for Johns Hopkins Hospital, Johns Hopkins Bayview Medical Center, Howard County General Hospital, Suburban Hospital and Sibley Memorial Hospital. She obtained a BS in Medical Technology in 2000. Over the last 16 years, she has worked in various roles in Lab Medicine. Those roles include transfusion medicine, immunology, special chemistry and laboratory management. 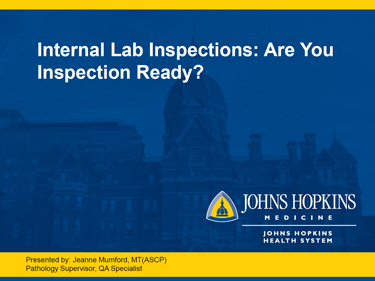 Jeanne offers years of experience in regulatory oversite, quality assurance projects and laboratory inspection preparedness and planning. She was part of the team responsible for building and implementing a universal EMR for Johns Hopkins Community Physicians. Her team today works closely with providers across the enterprise to support and embrace patient and family centered care.